Bullitt Group and Land Rover introduced the Land Rover 'Explore', a ruggedized smartphone, at MWC this week. The new handset is designed primarily for active travelers who go to places with challenging conditions and require not only protection against water, dust, heat or accidental falls, but also a prolonged battery life and a very precise hardware GPS. 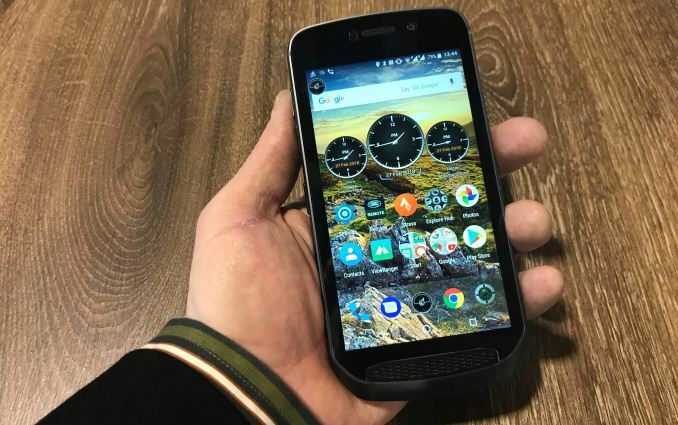 Bullitt is mainly known for its Cat-branded heavy-duty smartphones designed for people who need to work in tough conditions, such as construction workers, first responders, drilling site workers. Such handsets are good for their target audience, but they are not always a good fit for other users who need reinforced phones, such as long-distance truck drivers. The company recently procured a license to use the Land Rover brand for smartphones, so with its new handset, it is expanding its product range beyond phones for workers into phones for outdoor enthusiasts and professionals with specific demands. The choice of the Land Rover brand for a phone designed for outdoor adventures makes a lot of sense as these cars have historically been associated with off-road activities. The Land Rover smartphone also follows Bullitt’s paradigm of adding relevant special-purpose hardware and some software enhancements to ruggedized smartphones: the Explore features a special SOS flashlight, comes bundled with an add-on that contains a powerful Garmin GPS with an antenna, and a 3600-mAh battery. 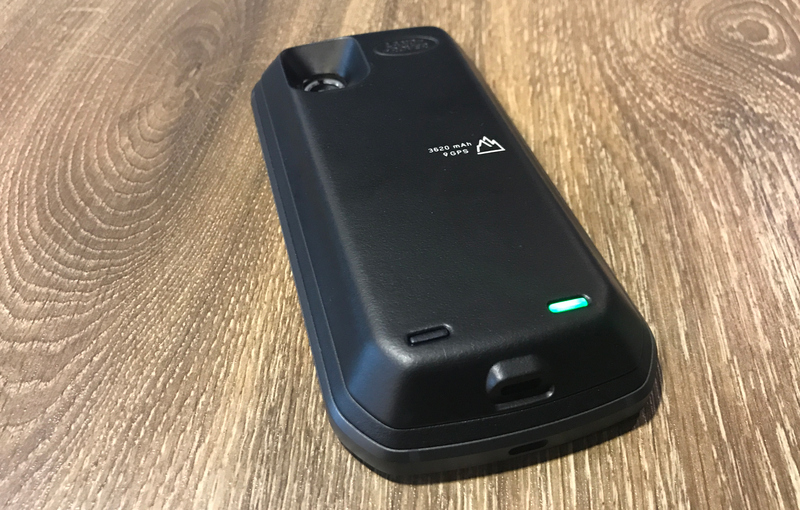 In addition, Bullitt will offer a 4370-mAh add-on battery pack as well as a special kit to mount the smartphone on a bike. Both add-on devices can be easily attached to the magnetic back of the phone. The Land Rover Explore smartphone comes in a massive aluminum chassis that is strong enough to survive drops from 1.8 meters. 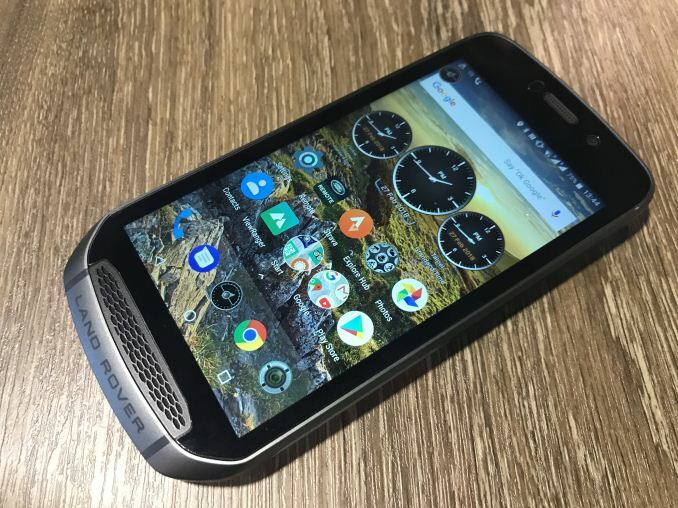 The company believes that a reinforced aluminum frame is good enough for ruggedized phones, possibly because of weight, cost, and other concerns. The 5-inch Full-HD (1920x1080) display of the handset has an increased brightness and is protected using Corning Gorilla Glass 5. The touchscreen can be used with wet fingers and while wearing gloves, a standard feature for phones that are supposed to be used primarily outdoors. Just like its high-end Cat-branded brethren, the Land Rover Explore smartphone is IP68-rated against dust and water, it can survive for at least one hour if it is submerged underwater beyond one meter. In addition, the phone has protection against “extreme temperatures and thermal shock”, but the manufacturer does not specify the word extreme here. 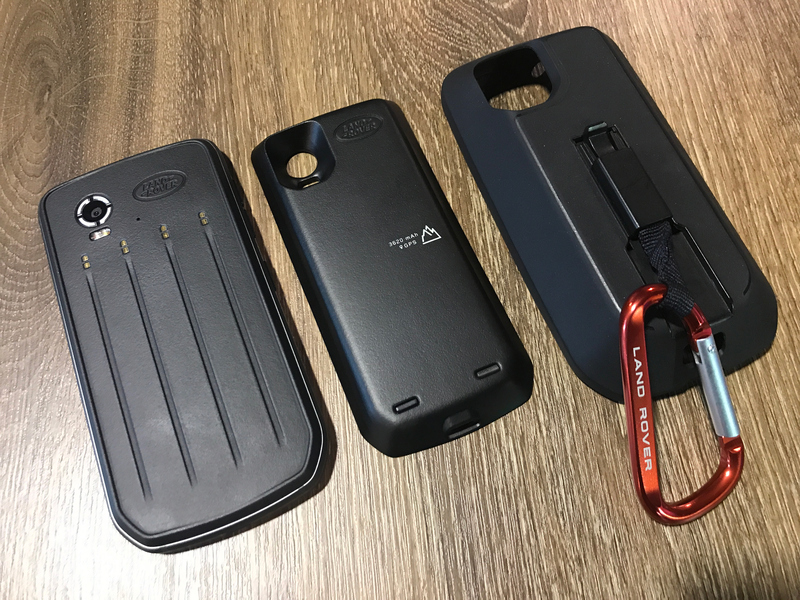 The Land Rover 'Explore' outdoor phone is based on the 10-core Mediatek Helio X27 SoC (two A72, quad A53, quad A53, Mali-T880MP4) and is equipped with 4 GB of LPDDR3 RAM as well as 64 GB of NAND flash which is expandable using microSD. The SoC is listed as supporting dual-SIM functionality, up to LTE Cat 6, Bluetooth, and 802.11ac Wi-Fi, although 802.11ac is unconformed on the phone. The choice of the processor was probably specified primarily by its core count and configuration. Assuming that a travelers’ phone has to perform various tasks that may need an added compute horsepower (fetching loads of data and processing it requires quite some oomph), but may run various apps on the background, an SoC with two high-performance cores and loads of low-power cores running at 1.6 – 2.6 GHz makes sense. Dual-SIM capability of the MT6797X is also an advantage since in many countries cellular coverage varies from an operator to an operator and is very uneven, especially in rural areas. 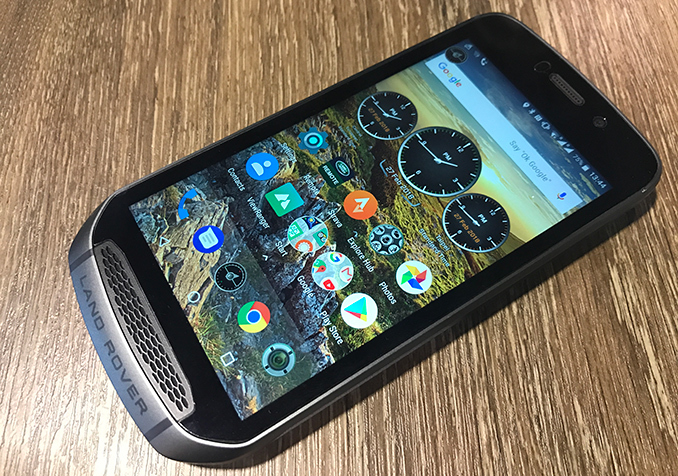 Obviously, the Helio X27 will not set records in benchmarks, but since the Land Rover Explore is supposed to be a secondary phone for travelling, it is unlikely that it will be used by people who need top notch-performance. Two Arm Cortex-A72 cores and an ARM Mali 880 MP4 graphics may be good enough for mid-level graphics interfaces. Imaging capabilities of the new unit include a 16 MP rear camera with a LED flash as well as an 8 MP front camera for selfies. Besides hardware features, Bullitt provides a number of software enhancements. First off, the handset has a special customizable outdoor dashboard on the home screen that provides access to various important information (e.g., weather, sensor data, etc.) and tools (e.g., compass, SOS light, etc.). Secondly, the phone comes with a voucher for a choice of country-wide or custom region topographical maps by ViewRanger with AR Skyline feature. Finally, there is a special red-light filter feature to reduce screen glare at night and preserve owner’s natural night vision (after glancing on a regular smartphone at night, your eyes need to adapt to darkness after that, which is undesirable in many situations) — this is something that has been available on Apple’s iOS for a while, now Bullitt brings this capability to a rugged Android-based smartphone for the first time (at least according to my knowledge). There are, of course, other software features and tweaks by the manufacturer (such as the phone comes with the Land Rover Remote software to connect to cars, but the program can be downloaded to any phone), but the aforementioned three are the headliners that will likely be appreciated the most. The Land Rover Explore is displayed at MWC, so I took an opportunity to see it up close. The smartphone is showcased on a stand and MWC visitors can hold and try it. Menawhile, in a bid to show the confidence of its hermetical sealing, Bullitt is demonstrating the phone in a special chamber with water flowing on two smartphones from above. Naturally, the humidity in the chamber is quite high, but I am not sure about the temperature. The phones continue to operate for hours, so their protection seems rather robust. In fact, one of the phones was partly submerged all the time, further proving that the LRE’s sealing is rather good. Unfortunately, it is close to impossible to picture the phones behind glass covered with water drops, so all I have for you is a short video that gives a basic understanding of the demonstration. The overall design of the Land Rover Explore smartphone is very solid. The front grille resembles that on the actual Land Rover cars, whereas the dark grey anodized aluminum frame gives a feeling of a premium device. Like any other phone with a 5-inch 16:9 display, this one is rather large. Furthermore, the hermetic sealing and reinforced chassis make the phone considerably bigger than any regular 5” handset, just compare it to an Apple iPhone 7 on the picture below. Meanwhile, the edgy shape of the Land Rover Explore makes it very comfortable to hold (obviously, everything is individual here). 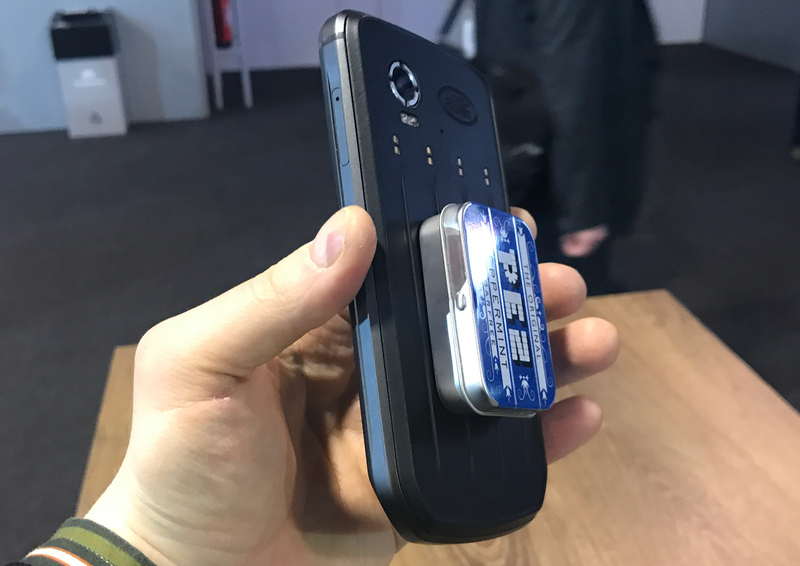 The backside of the phone is magnetic to attach add-ons, though it will magnetize everything, such as a pack of mints or keys. This should be kept in mind when using it, as the LRE can damage magnetic ribs on credit cards and there are some countries where cards with a chip are still uncommon. The add-ons for the magnetic attachments are also IP68-rated, and the extra protection adds to their weight and dimension. Once attached, an add-on makes the already big phone extremely bulky, but this is evidently a tradeoff between portability and protection. 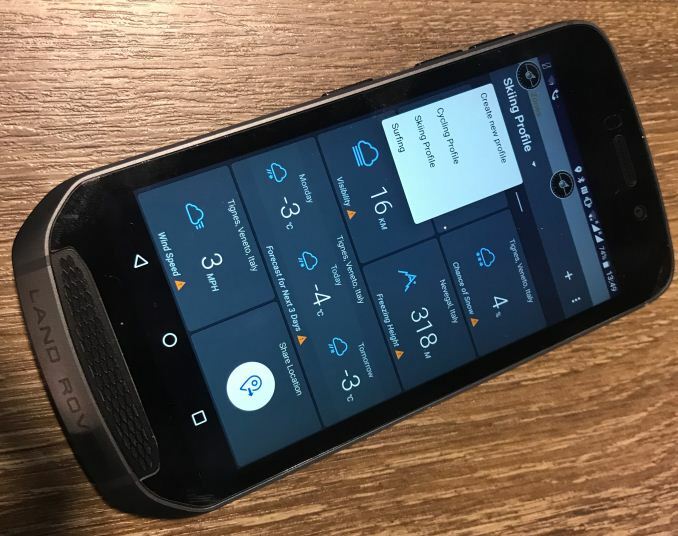 Software enhancements that Bullitt promises seem to be there and work quite well: the phone can fetch detailed weather information and sense what is going on around it. The GPS software looks considerably more advanced than Google Maps, but it was not possible to try the AR Skyline feature inside at the time of the hands-on. Furthermore, it did not make a lot of sense to test imaging capabilities of the phone (a very important feature for a travelers’ handset) inside and evaluate photos only on the phone’s own display (the phones were not connected), but I suspect that imaging quality of the Land Rover Explore is in line with mainstream smartphones. Bullitt will start selling the Land Rover Explore smartphone in April. The handset will be available with the Adventure Pack (GPS, battery, protective case) for $699. While a $699 price tag puts the Land Rover Explore into the high-end category, it does not really compete against iPhones or Galaxies due to its unique positioning. Moreover, the product bundle somewhat enhances its value (a standalone GPS device from Garmin can easily cost from $200 to $500). And just a side note, considering the costs of outdoor off-road activities in general (as well as prices of Land Rover cars that can handle them), the LRE does not seem to be too overpriced. 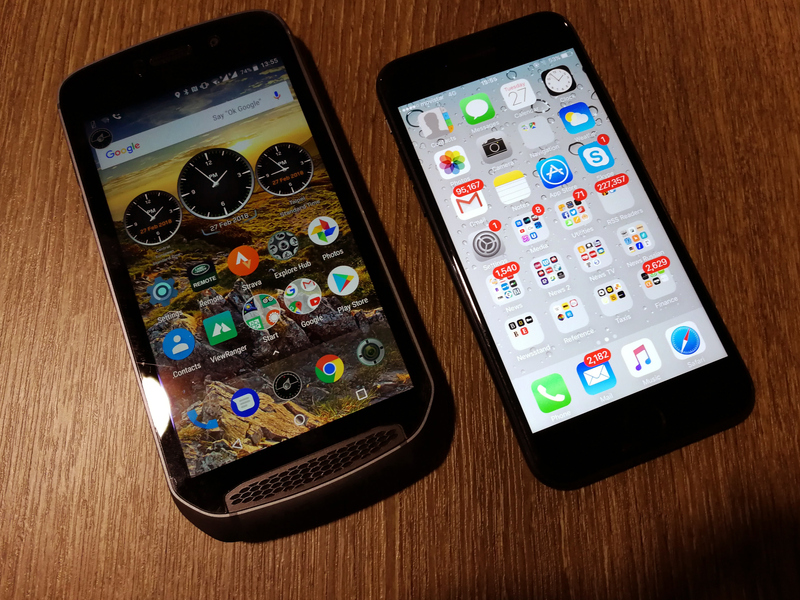 Big, thick rugged phones have their use cases. But why does Bullitt Group use Mediatek for most of their phones? A Snapdragon 660 or even a 630 would be more efficient. A 5.5" or 6" screen would make more sense if it's to be usable with gloves.